Here is a Thanksgiving greeting from Dr. Sherilyn Emberton, president of Huntington University. Members of the HU women’s volleyball team in Ethiopia. In the summer of 2013, Huntington University faculty, staff, and students took the institutional mission to “impact the world” literally as they traveled nearly 30,000 miles round trip to serve on three continents. The mileage they logged surpassed the circumference of the Earth – 24,901 miles. 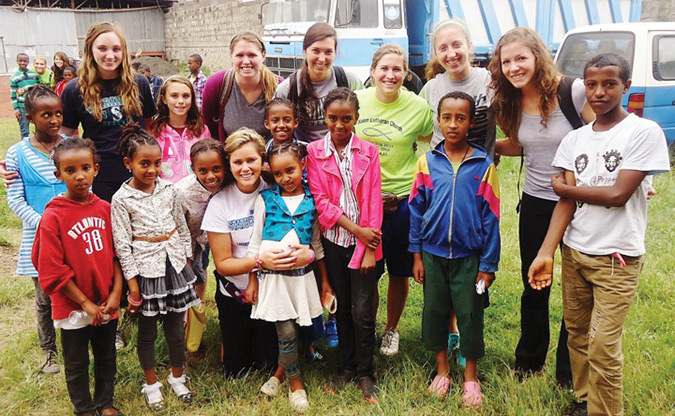 The Huntington University volleyball team learned the value of working and serving together through a summer mission trip to Ethiopia. Coach Amy Settle (left) and player Kelsey Kruse. The team worked with more than 1000 orphans and vulnerable children in three schools through Buckner International, a global ministry. “We learned about the depth of brokenness and poverty in the world, what resources are needed to impact this reality, and the joy that is possible through Christ amid the darkness,” said second-year coach Amy Settle. She plans to bring other teams to Ethiopia in the future in the hopes of building a school. During the summer of 2013, Huntington University faculty returned to China to lead a team of 15 persons, who then trained 80 Chinese teachers and hosted English camps for 200 students. HU has been doing this since 2007, and has trained hundreds of teachers in China’s schools. This year, for the first time, the English camps included high schoolers in addition to primary and middle-school students. “These experiences help better equip us for life in the global world in which we live, and they promote awareness and a value of diversity,” said Shoshannah McKinney (right), associate director of the Institute for TESOL Studies. McKinney, a 2003 HU graduate with a degree in Math Education, lived in China for four years, where she taught English at Liaocheng University. She and TESOL director Dr. Luke Fetters led the 2013 HU trip. Team members stayed with Chinese families in Doumen, a district in the coastal city of Zhuhai near Hong Kong and Macau. Dr. Mark Fairchild (right) has made countless trips to Turkey, including two this summer. His first trip involved leading a tour of Greece and Turkey for the Biblical Archaeology Society and then conducting research about the Apostle Paul’s missionary journeys. At the invitation of the Turkish government, Fairchild, Luke J. Peters professor of biblical studies at HU, made a second visit to Turkey this summer, serving as a consultant to the committee writing curriculum for a Christianity course to be taught in public schools. He led a team, including other HU faculty, in the planning and execution of a workshop that certified 37 Turkish Christians to teach the course. Huntington is currently the only institution granted permission to certify Turkish Christians for this teaching opportunity. Blue Rock UB church (Waynesboro, Pa.) baptized two adults and two children on Sunday evening, November 24. After a brief message on baptism from the book of Acts by Pastor Greg Helman, each person told how they came to faith in Jesus and why they wanted to be baptized. Then, they were individually baptized at the front of the church with many people watching and celebrating their decision. Churches with an attendance of 0-150. Churches with an attendance of 150-300. Churches with an attendance of 300+. Pastors and spouses can now register for these events. Program and other information will come later. Lodging for pastor and spouse. Downtime to relax and rejuvenate. Face-to-face time with Bishop Phil Whipple and National Ministries Director Todd Fetters. UBChurches.org, our online church directory, gives the latest average attendance we have on file for your church. Just do a search by church name or location. Bishop Phil Whipple (far right) conducting the ordination service. Bishop Phil Whipple (right) with Jason and Mary Garwood. 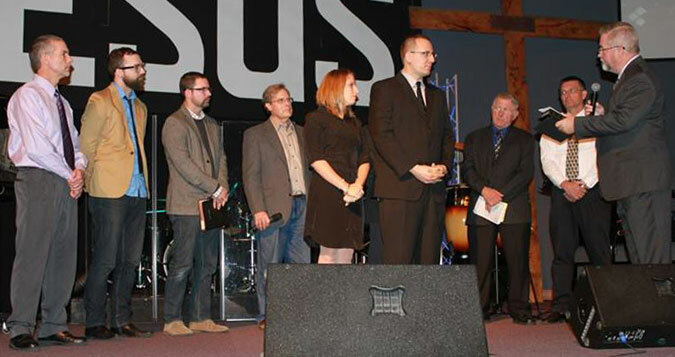 Jason Garwood was ordained on Sunday, November 24, by Bishop Phil Whipple. Rev. Garwood was named senior pastor of Colwood UB church (Caro, Mich.) in December 2011. 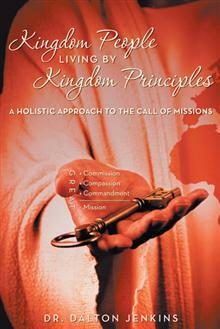 Dalton Jenkins (right), senior pastor of Bethel Temple of Praise (Yonkers, N.Y.), has published a book entitled Kingdom People Living by Kingdom Principles: A Holistic Approach to the Call of Missions. It can be ordered from Amazon, Barnes & Noble, and other booksellers, and is available for both the Kindle and Nook. “We do not have to travel to some foreign country to locate the mission field. Right here, literally in our backyards, the world has come to us. The church’s basic mission is to preach the gospel of the kingdom of God; this message has social and political aspects to its application. This is the fundamental responsibility of the church. “This message is holistic and affects the total person. As the church develops a comprehensive and practical understanding of missions, this will propel Christians to act out their missional call. The challenge as to how to be truly missional requires those people considered to be disciples to engage their communities in their everyday lives. Rev. 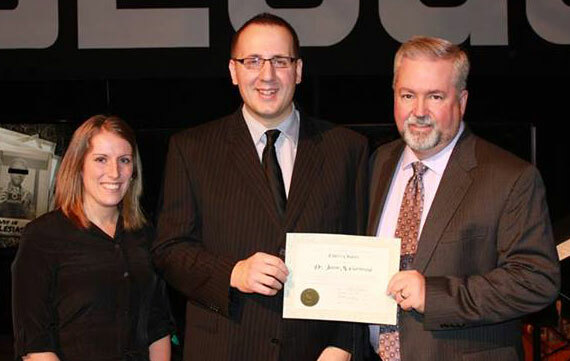 Jenkins recently completed his doctor of ministry degree. He also holds an accounting degree, and two master’s degrees (master of divinity and master of ministries in pastoral counseling). He has pastored the UB church in Yonkers since 2004. He is also a member of the Higher Education Leadership Team and of the Huntington University Board of Trustees. 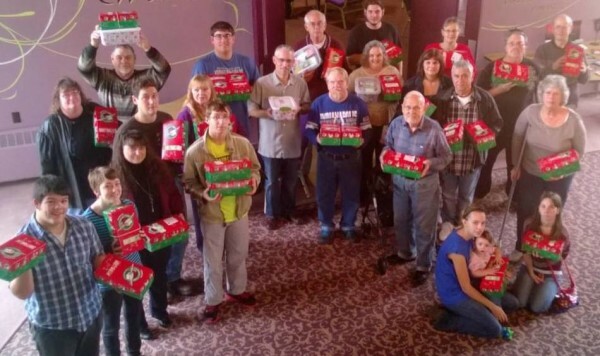 Fountain UB church (Keyser, W. Va.) has opened its door once again as a collection center for Operation Christmas Child. Last year, they collected over 13,000 shoeboxes, which Samaritan’s Purse will distribute to children around the world. At a Sierra Leone Muslim conference in 2013. 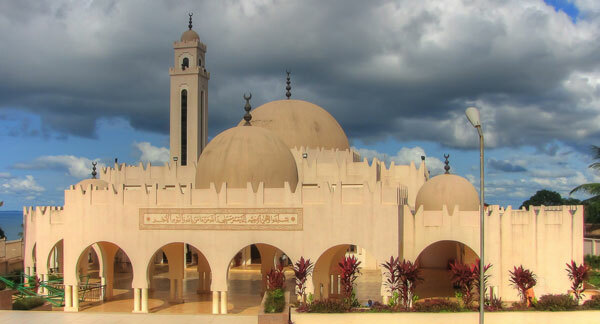 Freetown Central Mosque, built by former Libyan dictator Muamar Gaddafi. We don’t think of Sierra Leone as a Muslim country—not with its background as a British colony and the long history of Christian missionary work. 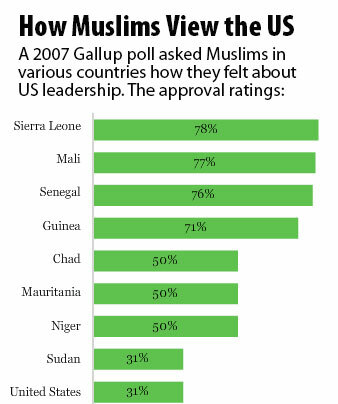 Yet 60% of Sierra Leoneans are Muslim. Only 20-30% of the people are Christians. The remaining 10-20% follow tribal religions. 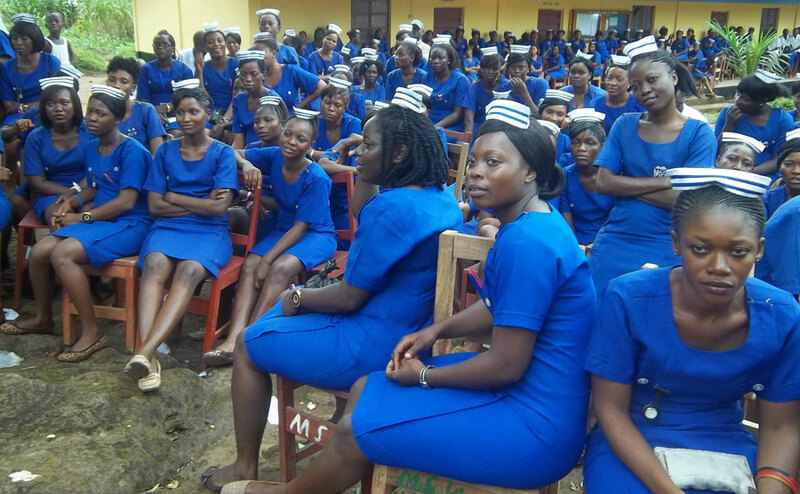 Despite the predominance of Islam, Bishop John Pessima says Christians don’t encounter opposition from Muslims in Sierra Leone. At least not like in some other countries. The lives of Christians and Muslims are intertwined in many ways, says Bishop Pessima. These intertwined relationships breed mutual respect and understanding. He also gives a lot of credit to the country’s Inter-Religious Council, which consists of Christian and Muslim leaders. John is a member. The Inter-Religious Council of Sierra Leone formed in 1997, partly to avoid opening a religious dimension to the rebel war. 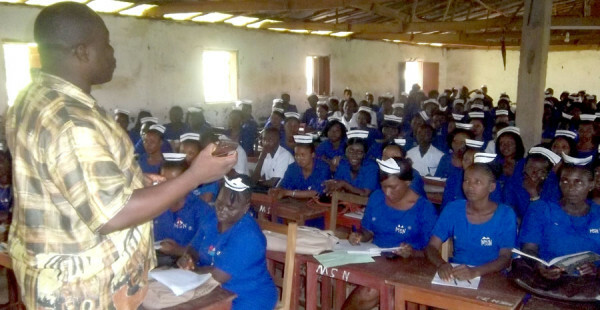 Founding members included the Council of Churches of Sierra Leone, which represents 18 Protestant denominations (including the United Brethren), the Pentecostal Churches Council, the country’s three Roman Catholic dioceses, and various Sierra Leone Muslim groups—the Supreme Islamic Council, the Muslim Congress, the Council of Imans, the Federation of Muslim Women Associations, and the Islamic Missionary Union. Soon after the IRCSL formed, a coup put a military junta in charge. Though the junta began targeting religious leaders, the IRCSL’s role is credited with preventing much worse conditions from prevailing. Later, as Bishop Pessima indicated, the IRCSL played a major role in peace talks with the rebel forces. 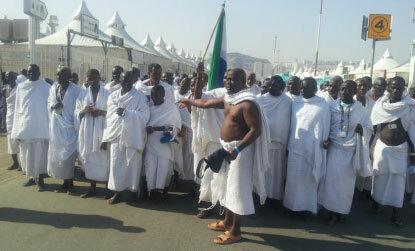 920 Muslims from Sierra Leone participated in the October 2013 pilgrimage to Mecca. But are Muslims open to the Gospel? “Oh yes,” he says emphatically. 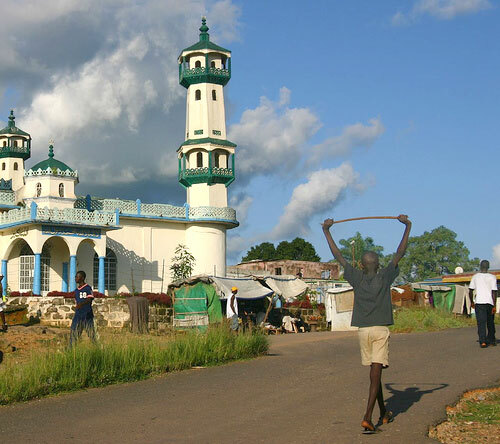 However, he is concerned about the Muslims clerics who come to Sierra Leone from other countries. They don’t share the mindset of native-born Muslims and Christians, and have the potential of injecting animosity into the relationship. 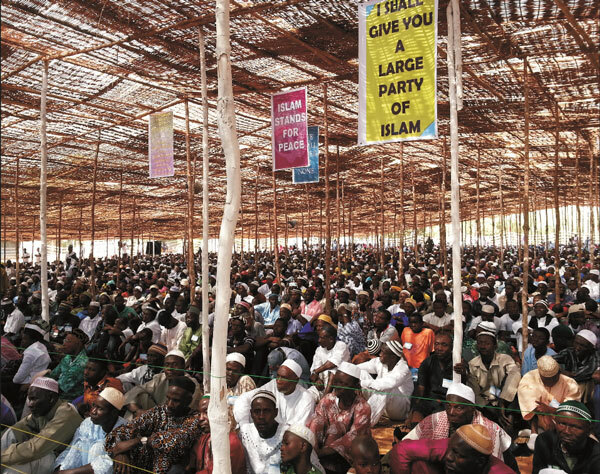 But for now, Sierra Leone’s Muslims and Christians live together in healthy and peaceful coexistence. 19 Nov Operation Christmas Child in Columbia City, Ind. A few years ago, our church started a new tradition. We began participating in Operation Christmas Child through Samaritan’s Purse. We begin asking people in October to take home shoeboxes and fill them with trinkets, toys, and love. Then the boxes are collected and sent to Samaritan’s Purse for distribution to children around the world. It is something that our congregation loves to do! Our youth group also participates. Each youth brings some of their own money, and we shop together (this helps them learn how to budget), fill the boxes together, and have so much fun. The youth group’s goal this year was 5 boxes, and they ended up with 6 completed. The congregation also had a record year, collecting 35 boxes total, an increase of 75%. Not bad for a congregation of 60! 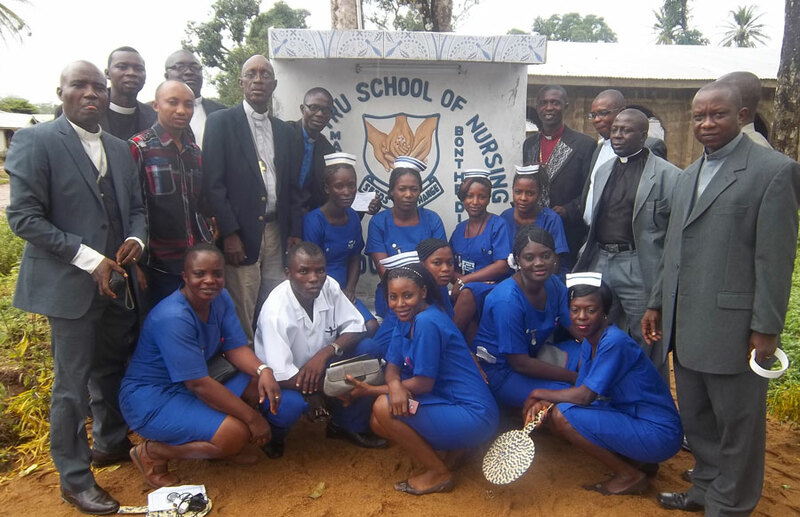 Nursing students and leaders around the school’s sign at Mattru. Ten years ago, Mattru Hospital started a nursing school. It has grown rapidly. Currently, says Bishop John Pessima, we have 526 students in training. They live in rented houses around the community.